At around 5:20 p.m., a couple of Wednesdays ago, Melissa Heldenbrand walked around Monument Circle with a stack of surveys clipped onto a clipboard in her hand, and a constant, shy smile across her face. “I’m what you call an operative and what we do is setup and teardown. We take surveys and we interact with the people around here,” she said. People walked by Melissa and stared as she continued to make her way around the Circle. 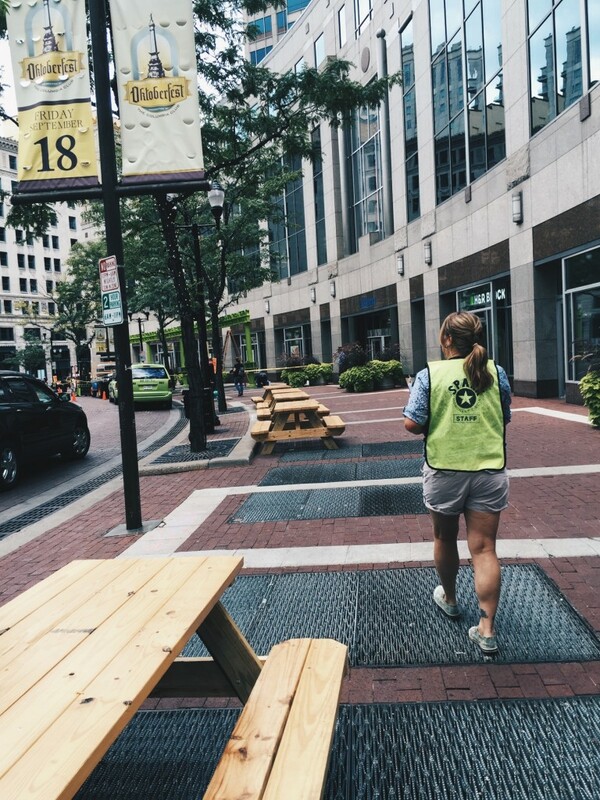 Her bright green vest made her a familiar sight for regulars of Monument Circle, especially because she worked five days a week. On this particular Wednesday, Melissa worked an entire day, setup to teardown. Melissa paused, as if she had realized that she hadn’t done any surveys yet, so with a timid and earnest tone, she approached several people about doing them, but they all politely declined. Melissa continued to walk, her smile still intact, as she approached the Welcome trailer. She said that she hoped that Spark would result in the spread of kindness and generosity. “And not judging who you’re generous to,” said Melissa. “And that’s the idea that I get out of it, and I’m hoping that that’s what other people will get from it.” Melissa reached the Welcome trailer; her walk had come to an end, for now. Her sincerity and overall graciousness about Spark brought a new perspective to the project, which reflects a timeless quote attributed to Lebanese-American writer and artist Khalil Gibran that states, “Tenderness and kindness are not signs of weakness and despair, but manifestations of strength and resolution.” Melissa’s effort and hopes for Spark have turned kindness and generosity at Monument Circle into empowerment and unity. Her effortless understanding of what Spark is and attempts to be makes the entirety of this project justified and necessary.